The 1905 Hopkins map shows much of the surrounding land as "Wm. Lea Estate" and Robert Lea and his heirs. The Lea holdings included the land inside a tight curve of Chartiers Creek and up Scrubbgrass Run around the base of Bower Hill. Leasdale Station of the Panhandle RR (PCCStLRR, later PRR) was located where the Pittsburgh and Washington Turnpike, now Greentree Rd, crossed the Chartiers Valley RR/Washington Div. tracks. According to the map, the Leasdale Station building was directly in the center of the course of present-day Greentree Rd where it connects to Washington Rd south of Heidelberg. The older course of Washington Pike can be followed south of this location, past Woodville U.P. and St. Luke's Episcopal churches to a point where it once crossed Chartiers Creek east of General John Neville's 1785 Woodville home. In 1903, the Wabash Pittsburgh Terminal Railroad built its higher level line across the hilltops. 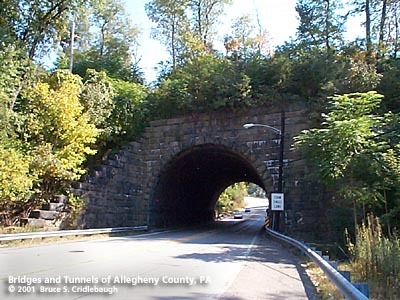 The outlet of the narrow ravine east of Leasdale Station was filled and this tunnel was built to allow the Washington Turnpike to pass through.